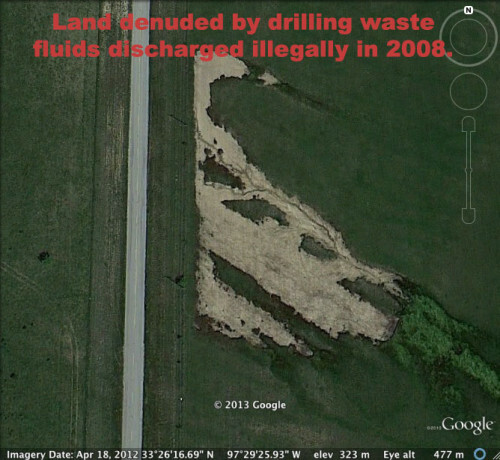 Discharging drilling waste on land is not new news, folks. The news this week about livestock drinking drilling waste has the “Internets” in an uproar but it’s an everyday event in Texas. When drilling waste is dumped–legally or illegally–on our farmland, into our rivers and into our air, it’s common sense that it will end up in our food chain. Drilling waste is in our food and the food our food eats. 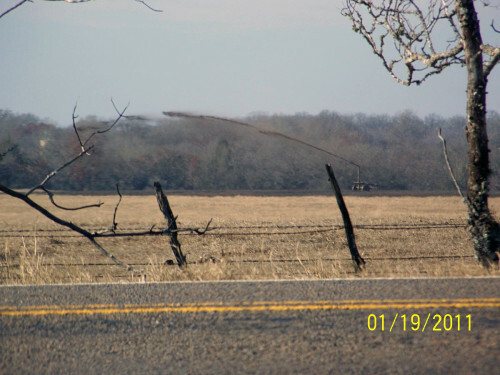 disturbance caused by construction of drilling locations, oilfield roads, and installation of pipelines can result in reduced crop production, increased susceptibility of the damaged sites to erosion, and increases in noxious and poisonous plant densities. …can accumulate in plant tissue (without harm to the plant) to levels which are harmful or toxic to animals and/or humans. The paper has many recommendations, one of which is thoroughly testing the drilling fluids before land application. Currently the industry does it’s own testing and asks landowner to “just trust us.” I recommend not applying drilling waste to land but, if you must, do baseline testing of soil, water and air and have a lawyer look over the contract. Last year, NPR reported on the loophole that allows toxic drilling waste to be dumped on Indian Land. Loophole Lets Toxic Oil Water Flow Over Indian Land, by ELIZABETH SHOGREN, November 15, 2012. The news this week that EPA allows livestock to consume drilling waste should not come as a shock to anyone who has been paying attention. I guess the shock is learning that the EPA is ignoring it’s rules. Again. If you want a strong EPA that enforces strong rules, then you have to stand behind them and stand up to the GOP’s oppression. We’ve heard the House Science Committee has yet another “Beat up the EPA and defend Range Resources” hearing grandstand session planned for the 24th of this month. Otherwise, you can have a Texas black angus beef burger raised on drilling waste with a salad of arsenic arugula. Fracking shale for oil or gas creates massive amounts of toxic, radioactive waste. It has to go someplace. 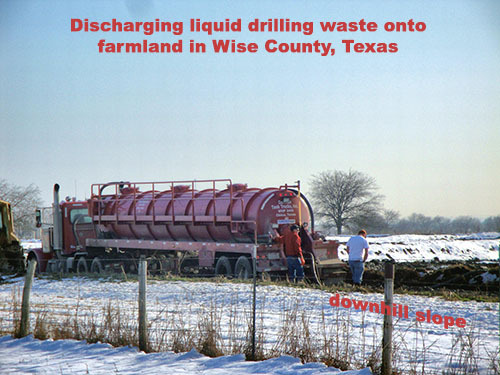 Drilling waste fact sheet specific to Texas. Fish Creek Neighbor recently posted..XTO Energy ~ A Master of Disguise? So much good information Sharon, thanks. It’s clear the waste is a huge problem and they don’t know what to do with it all, except hang the liability – and toxics – on the landowners. Fish Creek Neighbor, we get the same toxic waste salesman pitch here too. “In April a vacuum truck hauling drill cuttings to spread on the field (a process called land spraying) carried crude oil with it, depositing that on the field as well. Texas beef, Alberta beef … mmmmm mmmmm. And $80,000 a year for testing? I think New Zealand has the right idea – protect the people and the food. I like my CSA farm. It’s outside any shale areas. That’s fortunate, most of ours are smack-dab in the middle of one play or another. Companies are destroying some of our best farmland here and I’ve never seen so many power poles and power lines going in, I feel bad for the farmers who have to try to work around them. Most of ours are also but I specifically sought one that was outside the shale. 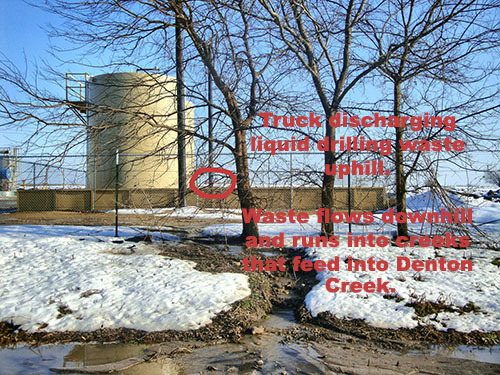 Guess what happens to some of the waste from Gas Wells? Nice job on that video. I guess we really are what we eat. Ditto on the great video David! Those yummy Texas T-Bones–makes you wonder what is in those steak? ?